MARION – Grace’s softball team was unable to maintain its early lead against No. 10 Indiana Wesleyan on Wednesday. The Lady Lancers led by three runs midway into the opening game, but IWU recovered to secure a 6-4 victory. The second game of the doubleheader was suspended due to field conditions in the bottom of the first inning, and the game will resume at a later date. 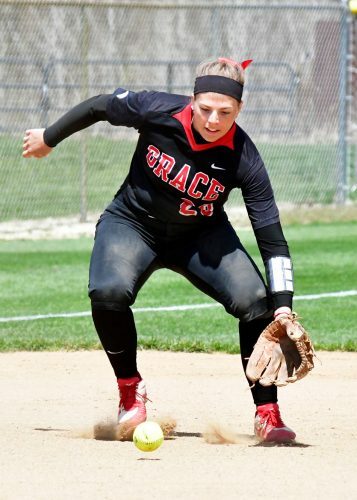 Grace pounced on the Wildcats (18-5, 3-0 Crossroads League) in the first inning of the opener with four hits. Taylor Asher and Olivia Scarbrough started the inning with back-to-back singles. The inning could have ended after with a double play on the next at-bat, but Morgan Tapscott and Britney Young produced two-out singles to score the game’s first run. The game remained 1-0 through three innings. In the top of the fourth, the Lady Lancers (4-11, 0-3 CL) struck again. Erin Lawhon singled to move Emily Bobb to second base, and Andrea Castillo was hit by a pitch to load the bases. Asher then produced a single to deep left field, bringing in Bobb and Lawhon for a 3-0 lead. IWU quickly erased that lead with a four-run outburst in the bottom of the inning, pounding out two doubles and a home run. The Wildcats added another single run in the fifth and sixth innings for insurance, and Grace was only able to bring back one run in its final at-bats. Jessica Kaurich singled to score Asher. Asher batted 2-for-3 with 1 run, 1 walk and 2 RBIs, and Kaurich was 2-for-3 with a run and an RBI. Dori Knight pitched the first 3.2 innings, and she relieved by Hannah Middlebrooks. The Lady Lancers remain on the road this weekend, playing at Bethel on Friday and at Taylor on Saturday.